"None shall pass!" 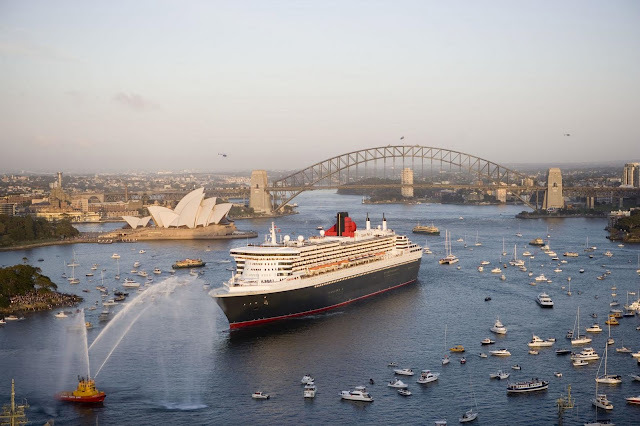 The largest liners must now stay in Sydney Harbour's eastern region. She’s 80 years old and all of Sydney is celebrating. Honestly, I don’t know if bridges have a gender at all, much less female, but the Germans think bridges are girls, so I’ll go with that. Yesterday, March 19, was the 80th anniversary of the much talked-about 1932 ribbon cutting that officially opened the Sydney Harbour Bridge. Poor Premier Jack Lang was upstaged by a mounted right-wing zealot with a sword and the rest, as is so often said, is history. In those 80 years, the bridge has become as much a part of the harbour itself as the Opera House and Luna Park facia. At least once every year she bursts into glorious splendour with fireworks to rapturous adulation. For the last decade it has been possible to (legally) scale her girders and stand triumphantly on her pinnacle. She has embraced Sydney as much as Sydney, and her millions of visitors, has embraced her. Queen she may be, presiding over numerous historic events including the terrifying Japanese submarine attack of 1942 and the drawn-out, slow motion construction of her architectural counterpart, the UNESCO World Heritage-listed Sydney Opera House. Jørn Utzon’s masterpiece in fact took five years longer to build than the bridge. 14,000 workers toiled for eight years hammering in 6 million rivets with 16 falling to their deaths The only one to survive was Irishman, Vincent Kelly, who landed feet first with his hands protecting his head although the urban legend has him dropping his tool belt/spanner/hammer to "break" his fall. He was back at work after six weeks of recovery. For 60 years she bore the entire cross-harbour traffic, including trains, until relieved by the tunnel in 1992, at which time she carried 182,000 vehicles every day. Initial toll was sixpence for a car and it is now as much as $4, depending on the time of day, despite the AU£6.25 million cost recouped in 1988. It is also no surprise that the world’s most prestigious cruise lines feature images of their illustrious vessels posing in front of the monumental structure, arrogantly presuming to add something to this already impressive vista. While she effectively bars access to the western reaches of the harbour by the largest liners, she will continue to reign supreme over all she surveys to the east, imperiously denying passage to those vessels impertinent enough to challenge her grandeur. Long may she span!